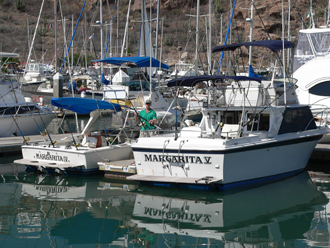 Margarita IV is a classic Bertram 25’ Sportfisher. that has been repowered with twin Engine Volvo gas engines and new outdrives. Cruising speed is a comfortable 20 knots, and her 10’ beam and design sustain excellent performance even in rough water. Fully equipped with modern electronics (GPS chartplotter, VHF radios, color CRT fishfinder) and top of the line fishing equipment (Penn International and Shimano Tiagra reels, quality rods, spectra line) she is designed to get you to the fishing grounds quickly and return you safety to port with maximum angling success. She will accommodate up to 4 anglers comfortably, and there is an enclosed marine head in the cabin. We have a fighting chair as well as stand up rod harnesses for angler comfort when fighting a large fish. Margarita V is our latest edition... a Uniflite 28’ sportfisher that has been repowered recently with twin Volvo diesels and new transmissions. She is a very comfortable boat for up to 6 anglers with room to spare. There is an enclosed cabin with galley, dining table, and a separate room with a porta potti. She is fully equipped with the same modern electronics as the Margarita IV (GPS chartplotter, VHF radios, color CRT fishfinder) and top of the line fishing equipment (Penn International and Shimano Tiagra reels, quality rods, spectra line) . Cruising speed is a comfortable 16 knots and the enclosed cabin provides even more protection in rough water conditions. Two fighting chairs plus stand up rod harnesses enable the anglers to handle the big fish in comfort. We practice catch and release on all billfish and will tag your billfish and submit release forms to the Billfish Foundation so that you can obtain an attractive "release certificate" for your trophy room. Minimum of 4 hours (1/2 day charter), and a full day charter is normally 8-9 hours. Rates include a box lunch, soft drinks ,water, ice, use of fishing gear and lures, and fish cleaning and bagging. For a small extra charge we will provide ballyhoo bait (a billfish favorite) and will vacuum seal your catch to take home. Rates do not include the Captain's tip. A suggested range is 10-20% depending on how well the Captain did to make your adventure enjoyable. Deposits for advance reservations of charter trips are required, and are not refundable within 24 hours of the planned departure (except for bad weather conditions). 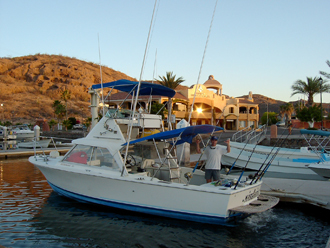 After your fishing trip, visit Ruby Wine Bar just a short walk down from the Margarita V dock. Located in the corner of Marina San Carlos along the boardwalk, Ruby Wine Bar hosts a full bar and excellent appetizers and personal pizza that can become meals. Happy Hour is from 4-7 with $1 Corona and Pacificos and $2 margaritas. Sushi is the specialty on Thursday and there are nightly drink specials. Live music starts at sundown on Wednesdays. Whether you are looking for an elegant, romantic atmosphere or a bar stool to rest on at the end of the fishing day, give Ruby Wine Bar a visit. They are open at 4:00 P.M. daily except closed on Monday. Hope to see you there!